I have all my strip sets cut, most of them sewn, and quite a few of my squares sewn. Today I'm hoping to get some work done. Once all the blocks are finished, this will be a piece of cake to assemble, thanks to this drawing. 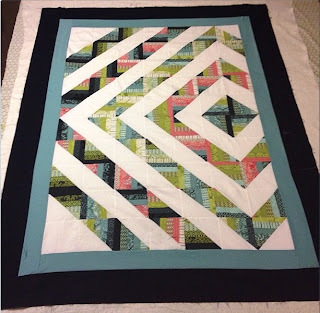 Of course he had to ask for the most complex quilt I've ever made, and I had to reinvent the wheel to get it done!! And these two need borders, quilting and binding!!! And now for my soap box. It almost pains me to write this. However, I feel that what is about to be said needs to be said and if I save one person the headache that I (and the other people involved in the conversation I've been a part of) then it's worth it. Let me start off with a positive. I have purchased MANY things from MANY designers over the years. I do believe that it's better to purchase patterns right from the designer because it's their hard work and I like giving them as much profit as I can, and have had tons and tons of successful and fantastic experiences with designers. My favorites are Camille Roskelly of Thimble blossoms, Julie Herman of Jaybird Quilts (the Radio Way quilt above was made from a kit I purchased from Julie! ), Lizzie B Cre8tive, Crazy Old Ladies, Sweetwater (TOTALLY in love with their stuff. It almost makes me wish I scrapbooked!) and all of my interactions have been amazing. The designers are great, their products are great and I can't say enough good things!!! And then I had a really bad experience. I had hoped I was the only one, but alas, after reading a stream of 24 emails in a group of 30 quilters I find out that I am the fortunate one. I can only hope that in reading this two things happen. No one else will be taken advantage of, and two, maybe the person in question will make right on the situation. In September Sandi Henderson offered a "surprise box" on her portobellopixie blog, "It's pretty simple.. you purchase a box, (medium sized priority) I stuff it until it can take no more, you get happy surprise mail!". Only the "surprise" for many was that the box didn't arrive (as of typing this, six of the 30 original orders still have not received their boxes). I ordered my box September 24, paid for the extra "sewn sample" (for a total of $80) and happily waited. On Sept 25, I got a notice from Paypal that my box had shipped!! Great! I was excited to see what the surprise box contained. And $55 for a medium flat rate box of fabric is a FANTASTIC deal. So I emailed Sandi and she replied and I was told my box had shipped, and that it should soon arrive. The USPS website had not been updated, and so I emailed her again after a week (so two and a half weeks total by this time). She did not reply. I left comments on her blog. She did not reply. I finally resorted to opening a paypal dispute. And I got an email from her husband Dustin on Oct 14. "We have run into a few delays in getting your orders in the mail as we have been moving to a new house and I have been working out of town. I am sorry for the amount of time you have had to wait to receive these orders. They will be shipping tomorrow. Thank you for your patience as we have been working to get your orders out to you." Annnnddd....nothing. Paypal dispute is now open and I am waiting. And my box arrived! More than a full month after I ordered it. It had some really cool stuff in it. However, it was by now way "stuffed" full as promised, but it was worth the $55 at full retail. a pincushion pattern and kit to make the pin cushion. and a fabric gift box. I was one of the lucky ones. Two received large pine cones to finish "stuffing" their box....which has nothing to do with sewing and fabric. But mine was missing my sample....after all the headache I was rather annoyed. I asked for a refund of my sample cost and was told that the sample would be mailed out....and I waited. and waited. and waited. I did finally get a pair of girls pants....of course they are nothing that I can use (they don't fit my daughter) so they were donated. But all in all it has left me with a bad taste in my mouth. I didn't get my samples until November....almost TWO months after I ordered everything, and I had to open a dispute. NOW I count myself lucky, because I DID receive a box, and it was MOSTLY worth what I paid for it....but I can guarantee I won't do that again....the paypal dispute and the waiting and the lackluster response has made me weary. UPDATE: I did get an email from Sandi offering to make things right. And I appreciate the effort. I also have heard that the people who did not get their boxes did get a refund. It's always nice to hear a happy(ier) ending to a saga! Great quilts. I like the third one. First - just lovely quilts. Yes, lesson learned but at a horrible cost - money and experience. Good for you in putting it on the 'air wave' and the others should too - customers make for the best advertisement - good or bad. Wow, what a terrible experience. :( Thanks for sharing, so that others know not to have the same thing happen to them! In better news, all your quilts are gorgeous! I especially love the navy, coral, and green one. Is that Neptune? Beautiful stuff! I did not participate in the soapbox issue, but I can totally relate. It really irks me that there are people out there taking advantage of us! I have had a similar problem with purchasing 'quilter's yard sale' items from a gal. I should have received my box in April.....and I'm still waiting!, and have emailed at least a dozen times. I even tried the Paypal dispute, but by the time I tried, they said it was too late! Great! I'm now trying to get my $60 refund, and I keep getting the runaround-avoidance answers (if I can get an answer at all!) like "Oh, I just found the MO on my desk!" or "We just moved, and all the stuff from my desk is in a box somewhere! Give me a few days to find it!"......UGH! I'm just sick over this, especially when I feel like it was a big scam to begin with. She listed her items as trying to make a bit of extra cash cuz her hubby was going in for surgery. So I thought it was helping her out! I'll never do it again! And I can't believe that they would put pinecones in a box to fill it! Sheesh! That's pretty bad!